After a late start, it looked like winter was actually going to make an effort this year. We had some cold spells, some snow, lots of ice, and the usual January thaw, but now it’s just losing steam. A February thaw is in the works, and the freeze out there this morning is the one exception in a ten day forecast that doesn’t even dip much below freezing. To be honest I’d be thrilled to see this in March or April… not so much February. I was expecting to spend most of February in the garage, hiding from the cold, and admiring the winter garden which has now officially replaced the workshop. 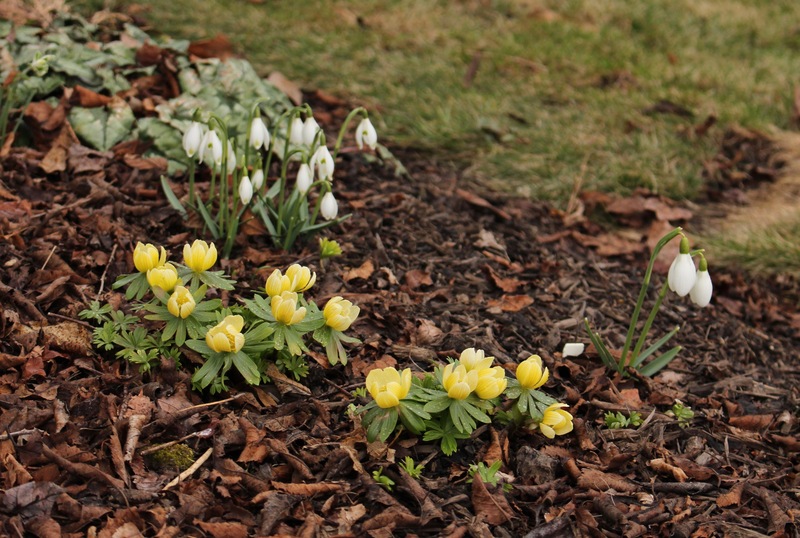 This weather will quickly bring on the snowdrops and winter aconite, and once that happens I’ll waste every minute of daylight wandering and poking around the garden imagining just how nice everything is going to be this year. In the meantime though, I’ve come to a decision on a real winter greenhouse, one which involves glass and benches and expensive heating. Before you get excited for me (doesn’t everyone get excited for people who get new greenhouses?) I want to make it clear it’s not going to happen. Our local climate is relatively extreme and although that in itself is an excellent reason to get a greenhouse, I just can’t commit myself to worrying about extreme low temperatures, brutal hailstorms and blizzards, heating system failures… and most importantly the extra heating bill. 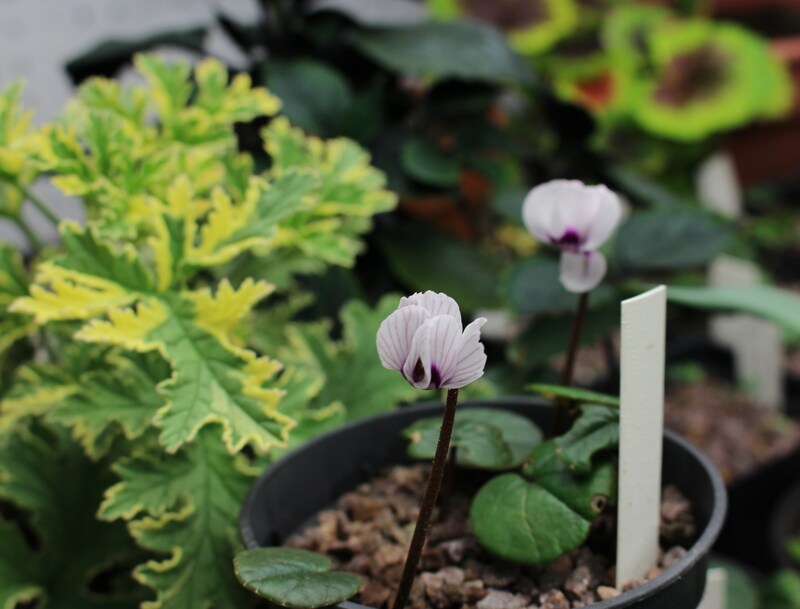 The hardy cyclamen (C. coum) are at their peak under the winter garden grow lights. For the second year in a row I’m wondering why I don’t have more in here. But wait! Don’t get the wrong impression here. I’m not having some budget-wise revelation that includes spending less and denying myself things in order to save for our retirement or the children’s education. I just came to the conclusion that with only a few more grow lights I can change the whole workshop over into a very satisfying pseudo-conservatory. So I did a little searching and found three more light fixtures on clearance. $39 a piece, about $120 total… so much better than their $52 normal price. A first time for me. Fern spores. You’ll have to trust me on this but there’s a tiny bit of black dust on that silver foil, and hopefully with it and an old baby food tub I can recreate what ferns have been doing for millions of years. $120 is an amazing bargain compared to buying an actual greenhouse, so in reflecting on how much money I just saved I don’t think I’d be way off in subtracting it from the budget rather than adding, but on second thought a visit to the accountant taught me a new word which might come in handy here. Depreciation. From what I gathered (and often what I gather is more what I want to hear rather than real facts) I can take this long-range purchase and pretend it’s really money which has been spent over a couple years. So for the 2018 budget I’m going to pretend I only spent $30 and we’ll see if I remember the remaining $30s in 2019, 2020, and 2021. Seed starting is well under way. 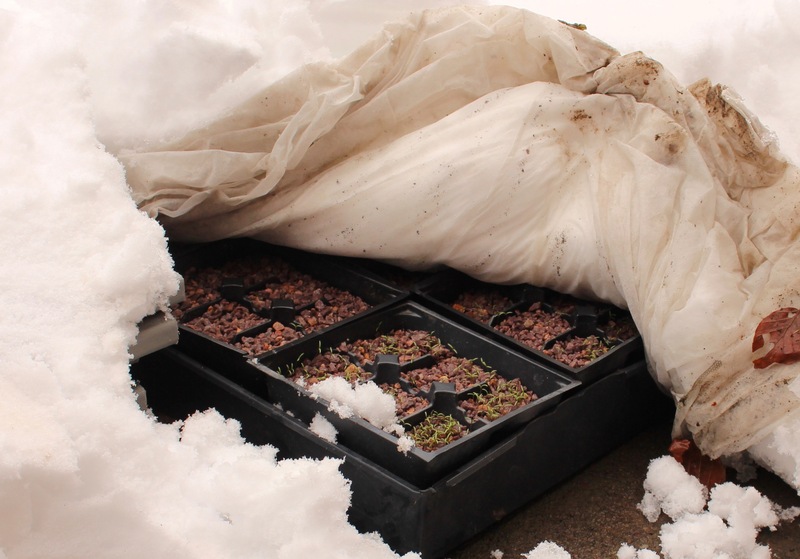 These will go outside today and spend the rest of the winter on the side of the house under a layer of garden fleece (aka Reemay, or spun row cover) until warmer weather encourages them to sprout. The lights are more of a next winter plan, but you never know. 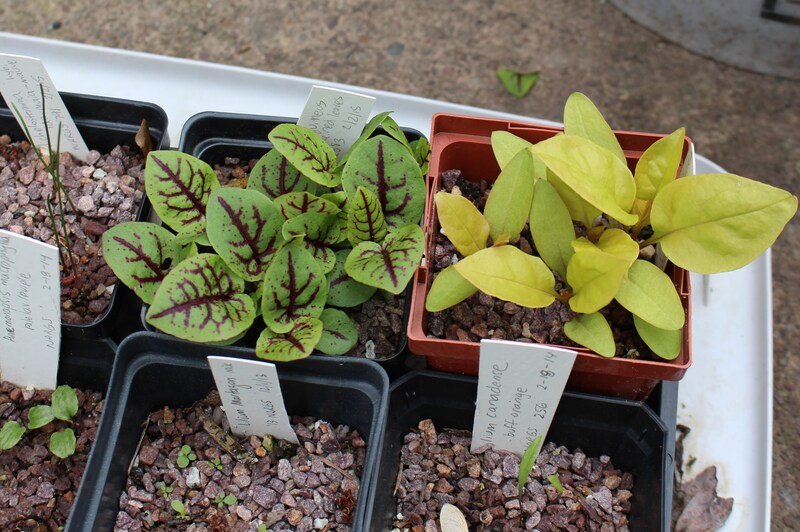 In a fit of boredom a week or so ago (apparently you can’t spend forever sipping beer and staring at cyclamen) someone got it in their head to pot up the coleus cuttings and start a few succulent cuttings. They’re in the very back of the workshop, in a room with the furnace, and hopefully will stay warm enough there to get shoots growing and roots forming. We will see. Rootless succulent cuttings newly potted up and coleus cuttings slowly recovering from the last few months on a windowsill in water. I don’t need more succulents in February, let alone May. It’s another one of those #becauseIcan moments, but I’m just itching with a compulsion to start more. Another 25 or 50 more isn’t out of the question and I’m sure something can be done with them in the spring. In the meantime have a great weekend! As it is with most things here, the gardener is not exactly on schedule with his gardening. He’s not exactly on schedule with many things, but the late freeze and the discouraging damage it did to so many spring greens has left him slightly unmotivated. Then the relentless rain and cold damp brought on rot, and now dry weather is bringing spider mites to the phlox. So the gardener will restart his spring in mid May and deal with the mites. He’ll also accept that many projects will again not happen, and will just clear his conscience and move on. Iris are beginning to bloom after all, and once the iris start to fill the flowerbeds with color and perfume it’s hard to hold onto a black mood. One of my last daffodils to open, narcissus ‘Keats’ was voted ‘ugliest thing to bloom’ by a more serious daffodil friend. I’m always one to love the underdog. 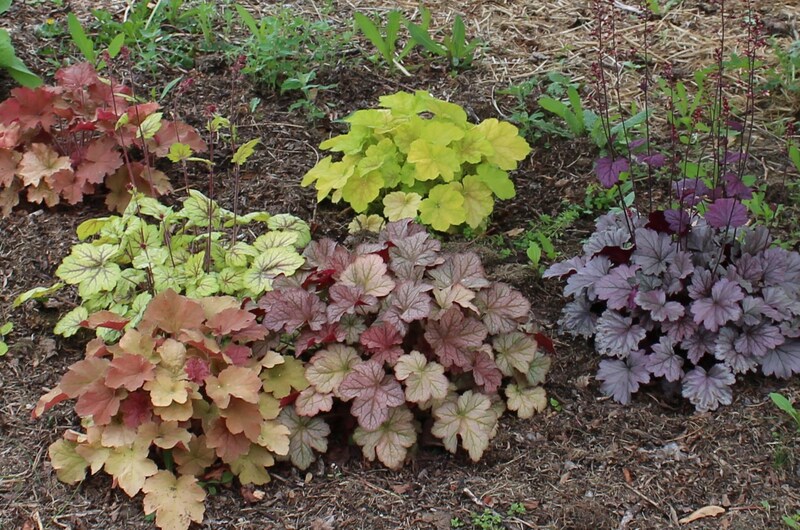 One minor project (which seems to be the only project type I’m capable of tackling this spring) which was finally taken care of was the long suffering heuchera plantings. A few summers ago I dipped my toes into the hybrid heuchera world and since then they’ve been suffering along in my garden. My planting beds get too dry, my shade isn’t as high and dappled as they’d like, and my soil is too heavy for their roots but I try nonetheless. They still have plenty of filling in to do but if you saw the before picture I’m sure you’d agree this is an improvement. Unfortunately the tan lawn clipping mulch doesn’t do much to set the foliage off, but it’s better than weeds I suppose. 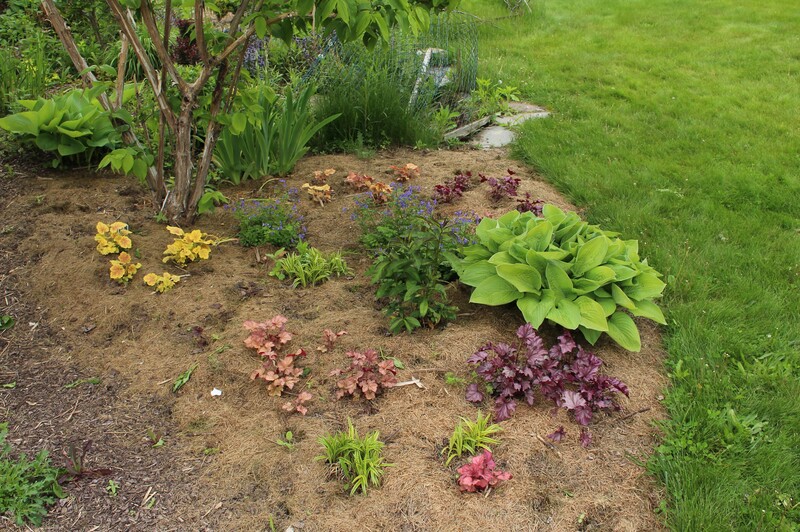 The woody stems of the heuchera clumps were dug up, ripped apart and carelessly stuffed back in to the re-dug bed and the plants actually look much happier after their tough love treatment. 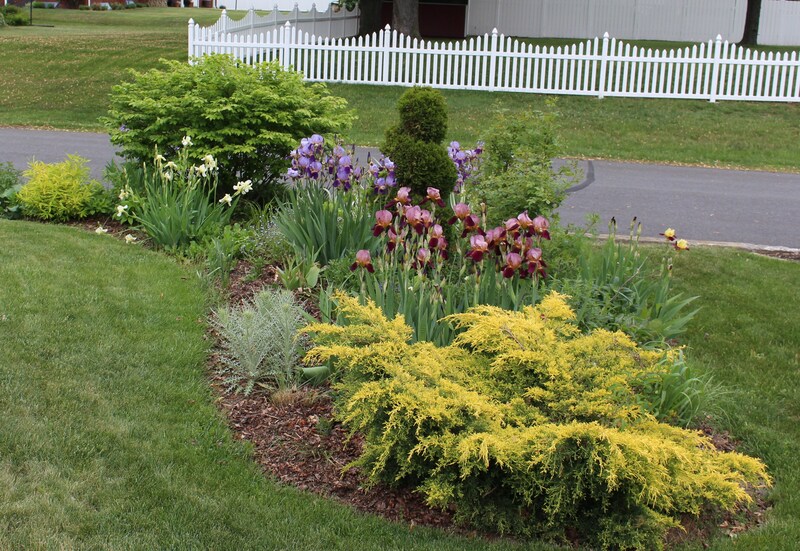 As summer heat settles down on the garden this holiday weekend, I just wanted to celebrate the meadow and a few of the newer plantings which did well this spring. 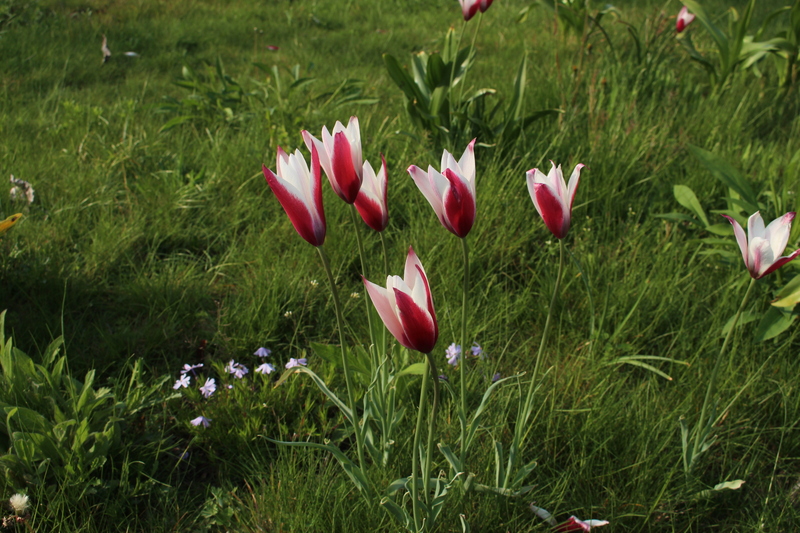 Number one on the list were the tulip clusiana bulbs which planted into the turf. They looked perfect out there and I hope they return just as nicely next spring. Tulip clusiana (I think they were a named variety but I’ll need to dig out the tag) were scattered around in the meadow garden. I will be extremely happy if they settle in here! A few Anemone blanda look nice in the shadier parts of the lawn. I tried throwing them around in several of the outer edges of the garden and then promptly forgot until little sparkles of blue started showing up here and there. My goal for this one is to recreate the neglected show which used to pop up each spring around my first apartment in upstate NY. If this plant can naturalize around a ramshackle college boarding house I think it stands half a chance here. 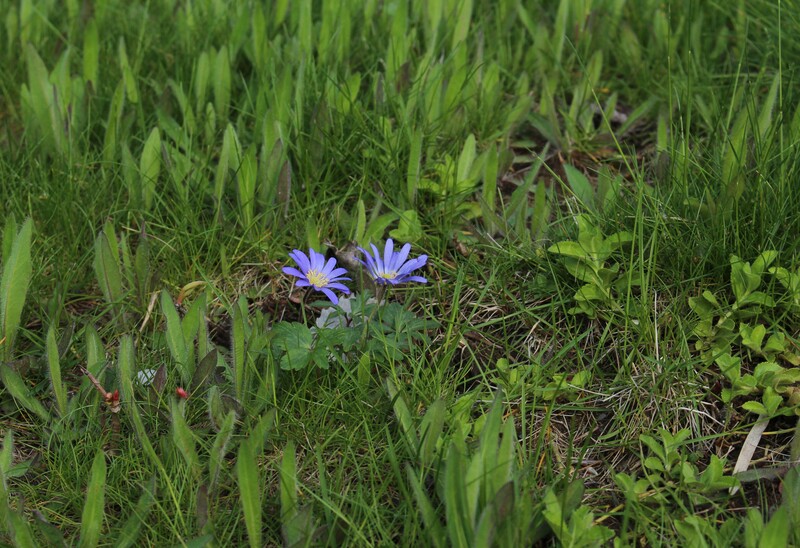 Blue Anemone blanda in the “lawn”. Muscari is practically a weed everywhere so I added a few of those as well. 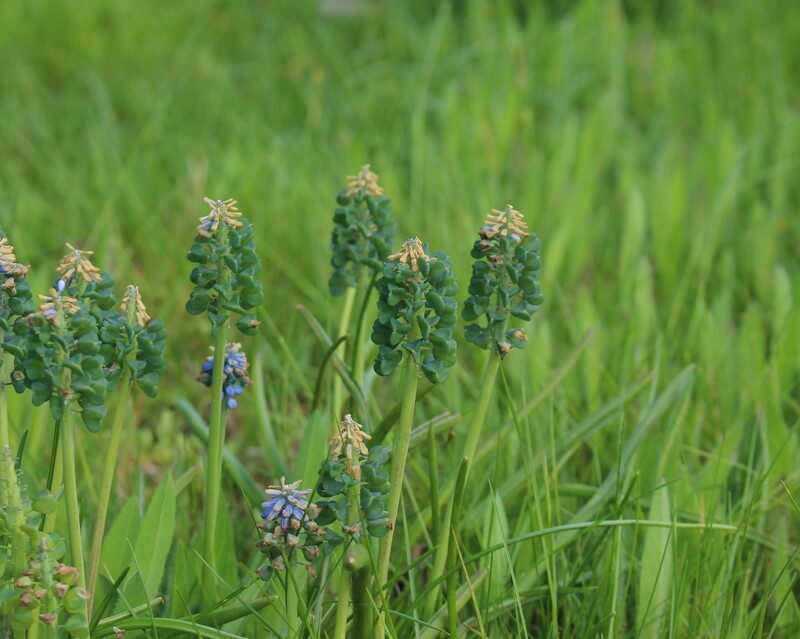 The flowers on these grape hyacinths were nice enough but now I keep looking at the seed heads with their kind-of aqua tint. I wonder if it was the cooler temperatures or if they’ll always have this attractive look…. or is it just me that thinks they look cool? Most of the bulbs were brought in as bulbs, but if you know me you know there are a few seeds coming along as well. 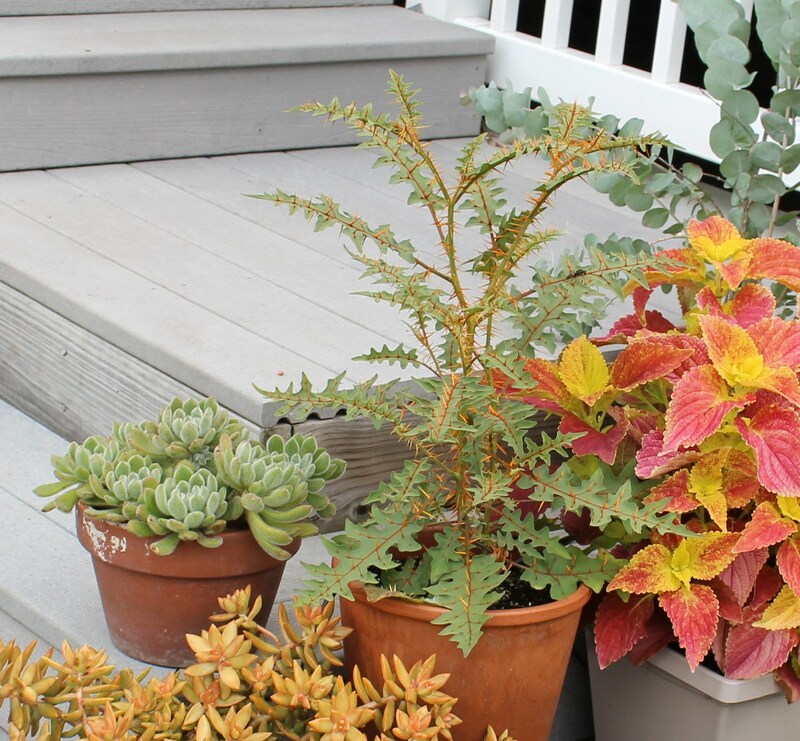 My little gravel covered pots are bursting with new plants this spring and even though the last freeze did a few things in the majority seemed to enjoy our mild winter. I’m always a bit surprised anything will grow up through gravel, but in some pots even the tiniest of seedlings make a crowded moss of new green sprouts…. which will soon desperately need thinning! 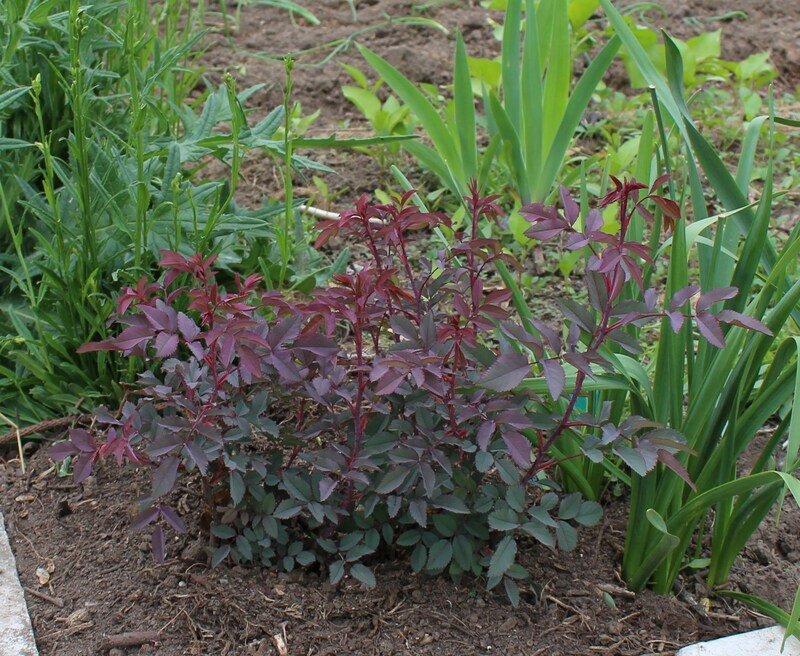 Hundreds of Hypericum ‘Albury Purple’ seedlings sprouting in the center pot. Realistically I need about two. 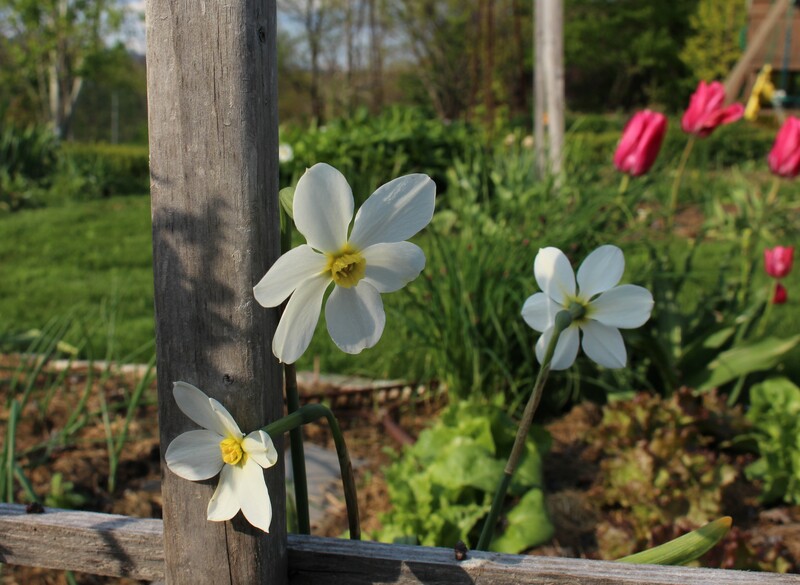 With new seedlings coming along each spring there are always new surprises as youngsters open their first blooms. A couple years ago I thought I’d dabble in a few species anemones and see how they do in the meadow, and although I’m not sure they’re all correctly labeled, for now I’m just enjoying them for whatever they are. 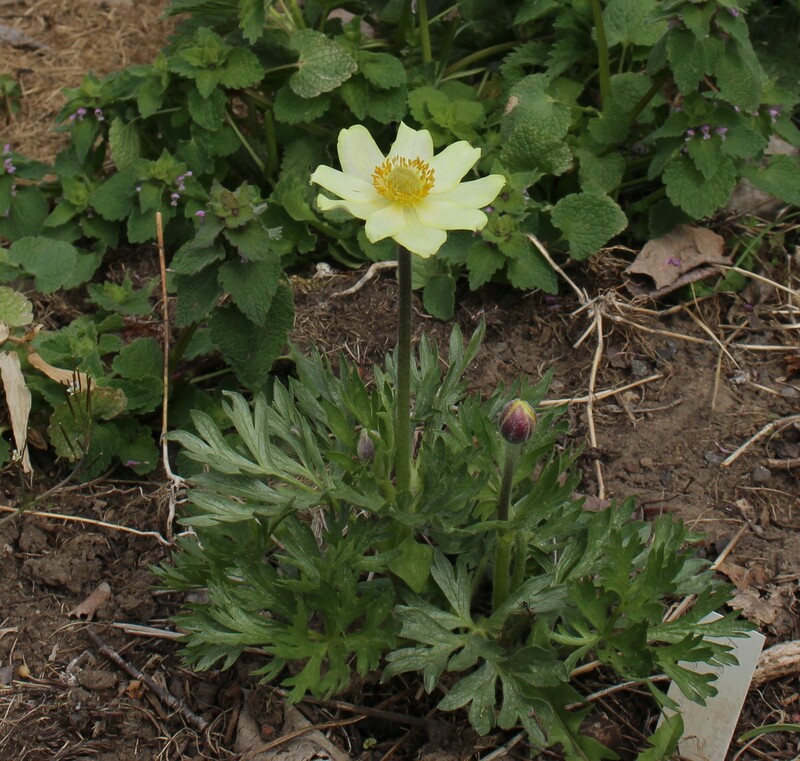 Not Anemone caroliniana? Pretty regardless, and it looks like it might be able to hold its own if I move it out into the thinner areas of grass. 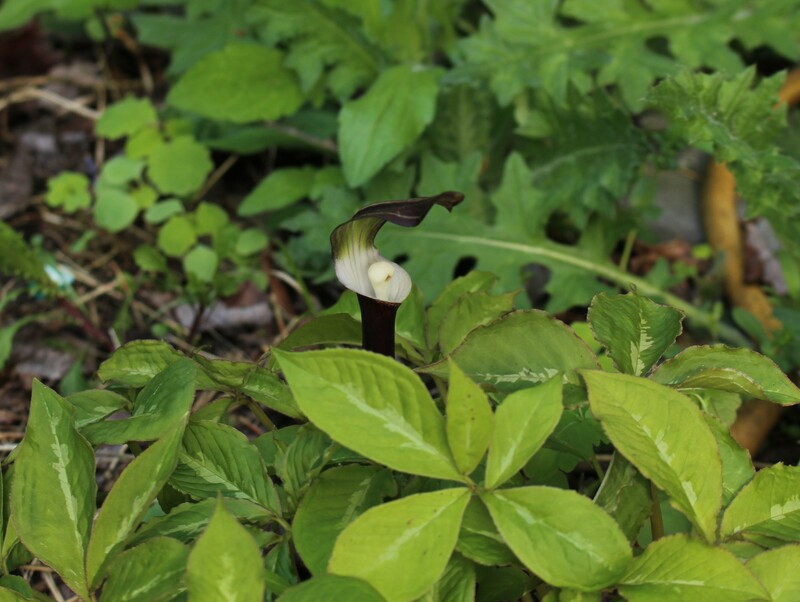 One seedling which has a positive ID is this cool little Japanese Jack-in-the-pulpit or snow rice-cake plant (Arisaema sikokianum). I was surprised to see any of these three year old seedlings flower, and although the actual flower is definitely on the small side for this species they say size doesn’t matter in these things and I’ll just keep admiring the fancy little bloom. Arisaema sikokianum. Although my picture doesn’t do it justice, I hope you can appreciate the mottled foliage and bright contrasts of this flower. I’ve been growing things from seed for decades. 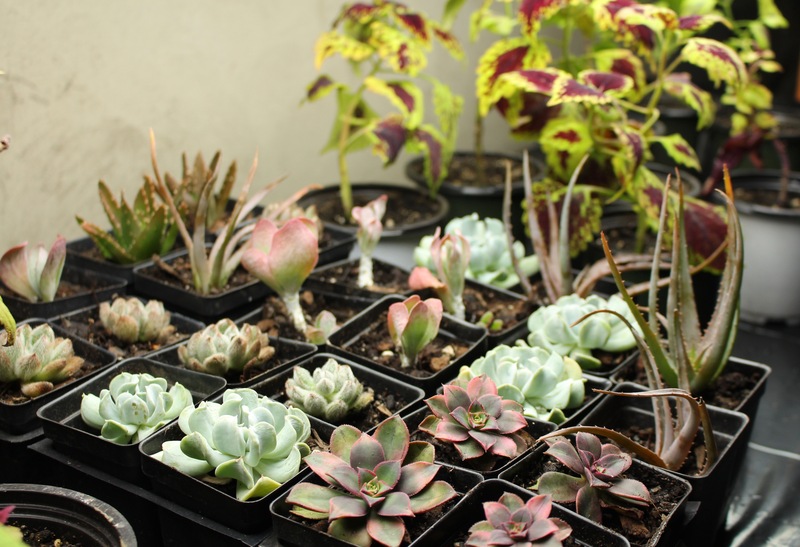 Odd things such as tuberous begonias and eucalyptus, which aren’t odd in themselves but which might be for the average teenager. A Saturday trip to the movies for ‘The Return of the Jedi’ and then a Sunday spent wondering if all his begonias will die from damping off disease can get complicated #teenproblems1983. As usual I digress, but one thing so often repeated is how much patience I must have and how complicated it must be. I just want to take a moment to say I don’t and it’s not. To prove that point lets take a look at the seeds I started over a year ago which have been sitting in the refrigerator ever since. A few days ago I finally made the effort to go through them and to be honest it speaks more of laziness and absentmindedness than anything else. 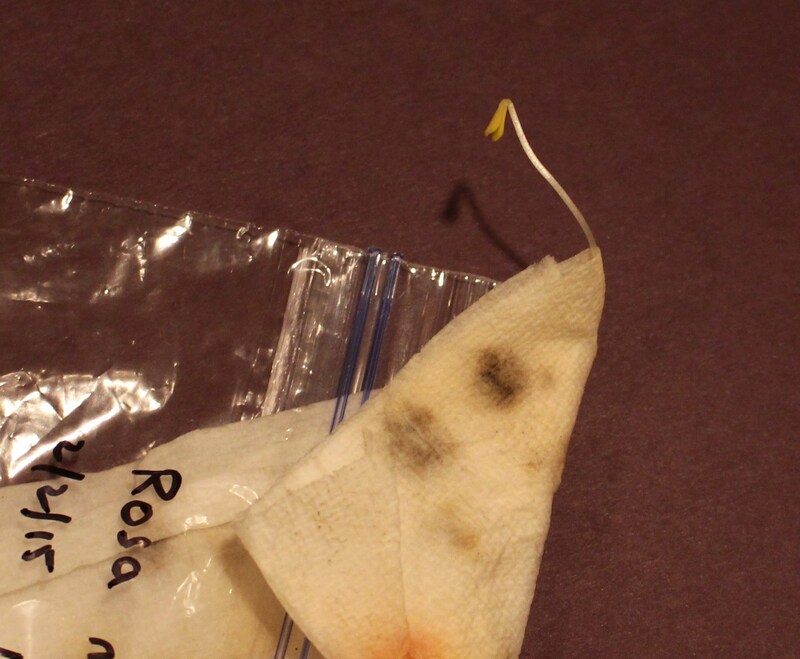 A single Rosa moyesii seedling sprouting on damp paper towels. Nearly perfect after a full year in a plastic baggie in the fridge. The scene was not pretty. Many of the seeds had molded up (or even sadder) sprouted and then died from my neglect, but one ziplock bag contained an amazing surprise. A single pale yet perfect Rosa moyesii seedling had edged its way out of the folded paper towels and was just waiting to be freed from its cold, dark prison. Better gardeners check their baggies every few days and not every few years, but luck was on my side this time and I now have a seedling of something I’d been hoping to sprout for several years. Of course luck would also have it that my fat clumsy fingers snapped the delicate little stem during planting (so we will never speak of this seedling again) but fortunately I also found a few hellebore seedlings, one of which still had enough flicker of life in it to plant. 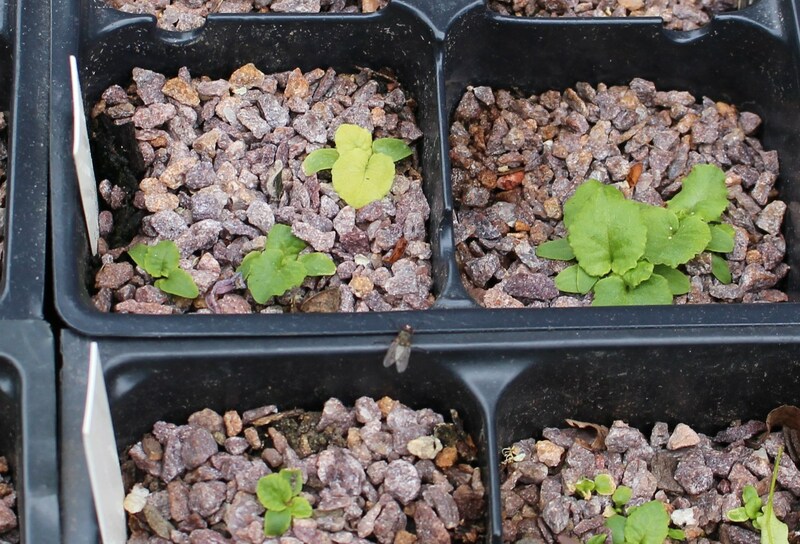 A single hellebore niger seedling. Given another three years it may amount to something, but for now I’m just happy to see it alive. 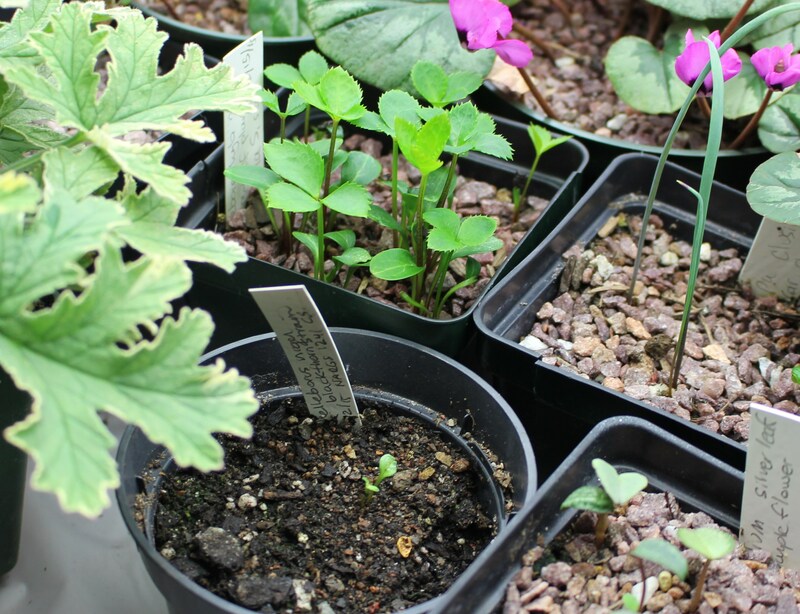 Note the other healthier hellebore seedlings in the pot behind it. These were sown last summer and then sat neglected for three months on the driveway, a method which I’ll have to recommend from now on. 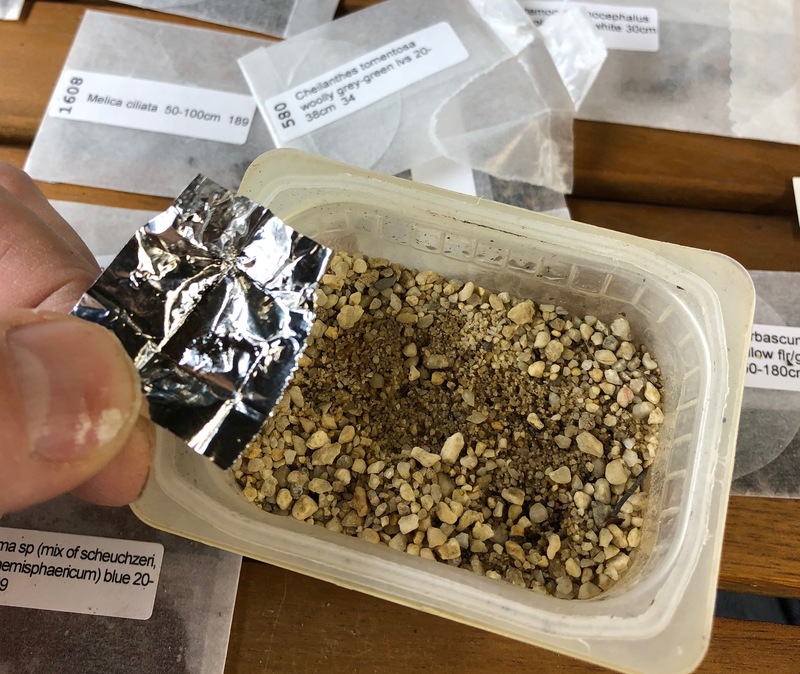 Some seeds wait for other triggers to start the germination process, and for a few baggies the warmth of the dining room table was just what they were waiting for. 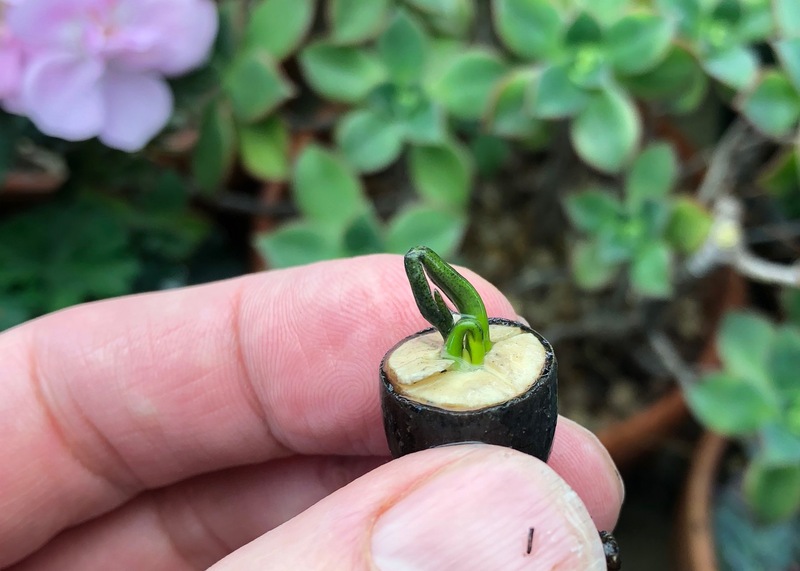 Within a week of taking the seeds out of the fridge I had three seedling of the hard to find, yet hopefully amazing, Chinese red birch (Betula albosinensis var. septentrionalis). I may be overstepping my optimism with these size of a pencil point sprouts, but given a decade I may be enjoying a brilliant grove of pink and red peeling bark backlit with the low glow of a late winter sunset. Or not. Patience will be required for this one, but in a few weeks I’ll be distracted by snowdrops, then tulips, then iris, then roses, and then before you know it I’ll be wondering why there are birch trees in the spot where I was planning a dahlia bed. Betula albosinensis var. 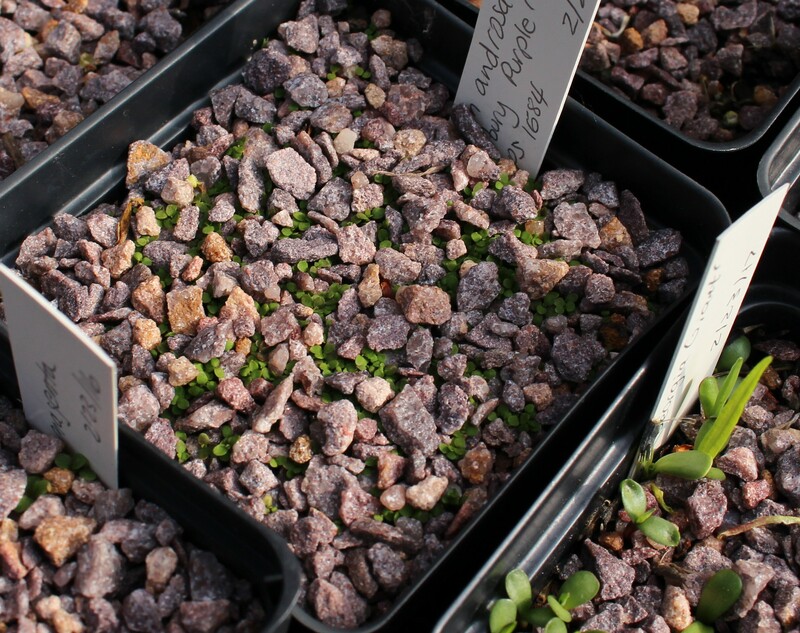 septentrionalis seedlings. Not all my seed adventures are purely theoretical. 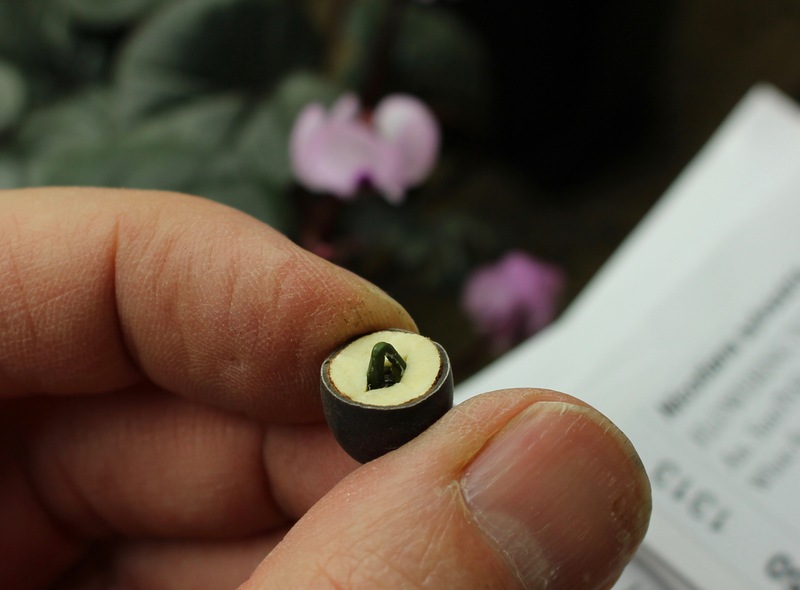 Two years ago I started a packet of Cyclamen coum seed which would hopefully produce the intricately lined, pale pink flowers of Green Ice’s Porcelain strain of this plant. Fast forward two years and they did. What a delicate flower, you wouldn’t suspect this one could survive the driveway germination method but fortunately it has. 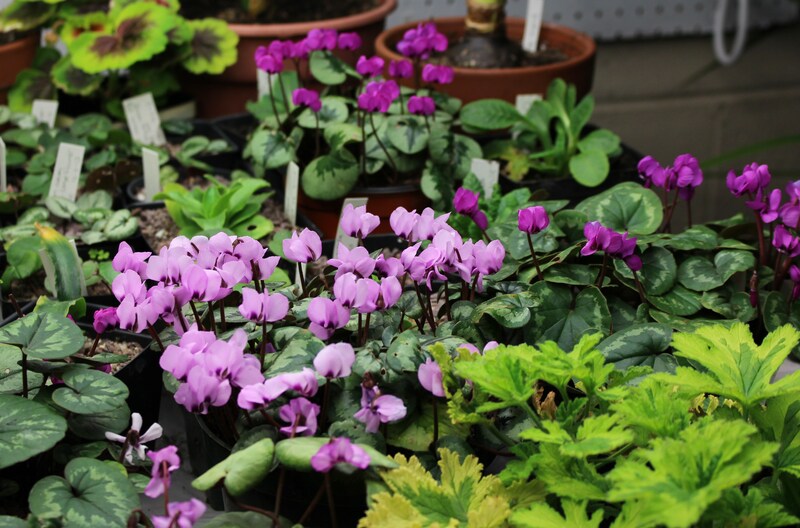 In general the Cyclamen growing in the back of the garage are filling the space with some very welcome winter color. At this time of year I leave the house before dawn and return after dark and it’s nice to be able to go back there and visit with a few of my plants before going to bed. It’s a lot safer too. I can only creep through the garden with a flashlight so many times before having to explain to one of the neighbors that the warm weather is bringing up the snowdrops way too early. 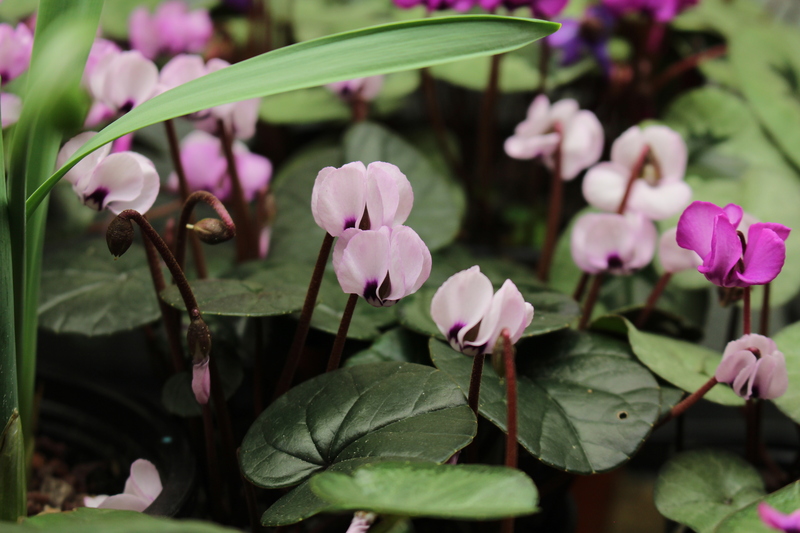 Cyclamen coum flowers filling the winter garden. They’ve been better in years past but still put on a great show. One final seedling. 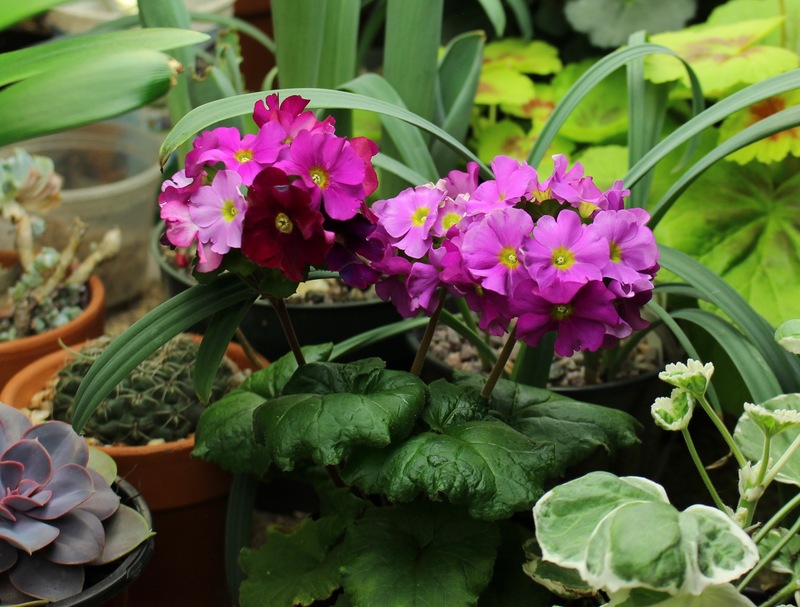 Last year I wanted to try a few new primula so I ordered seeds through the American Primrose Society’s seed exchange. They open their exchange to everyone once members have had their chance, so the sight of dozens of premium varieties still available for ridiculously low prices was irresistible. 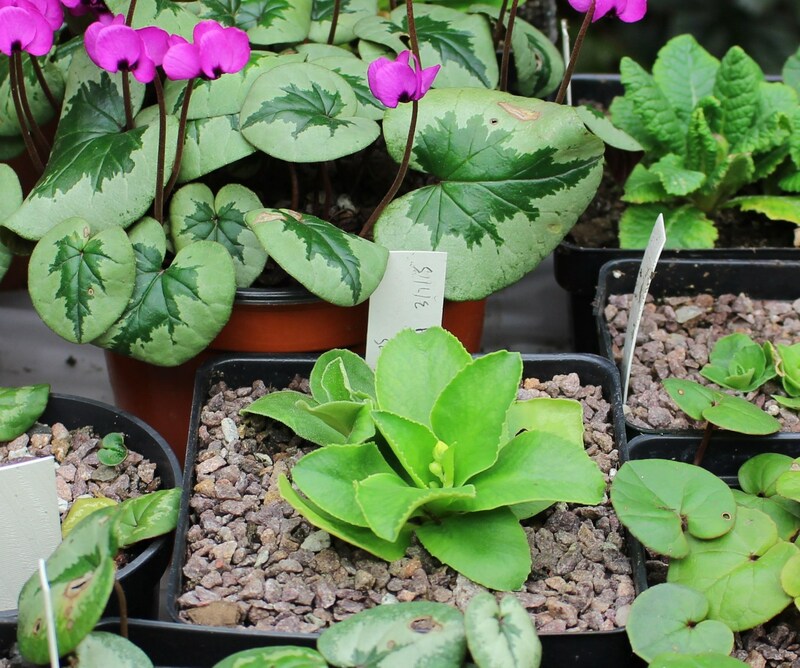 Who would think that even these could survive the driveway treatment, and although my seedlings are nothing to bring to a flower show I really can’t believe that one of my ultra cool Primula auricula seedlings is planning to bloom. I guarantee if it makes it you will see plenty of photos show up here…. and if it doesn’t make it, please don’t ask what happened since it will likely I did something stupid again and it will be several months before I’ll want to talk about it. 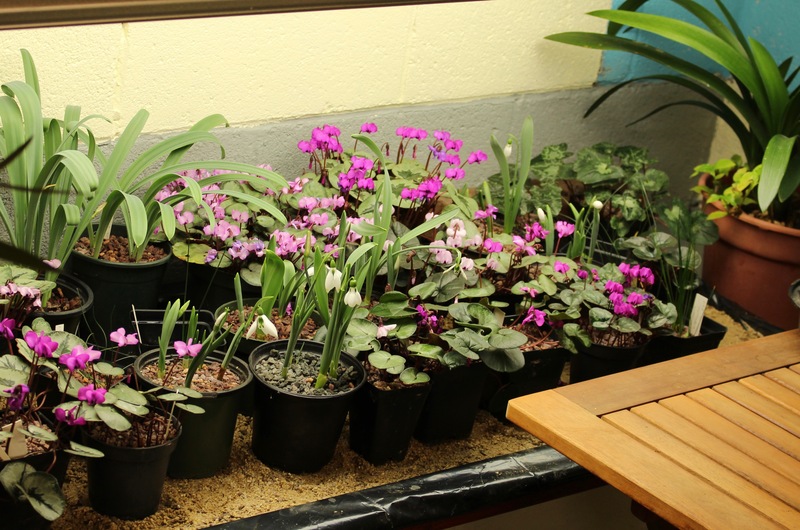 My newly found primrose enthusiasm had me rushing back to the Primrose Society’s Seed exchange. I thought I was ok last year but for a dollar a packet who could resist? Actually if I became a member it was less than $0.50 a packet so might as well join while I’m at it and be in a great position next year when the seed exchange first opens. So I did join and we’ll see what trouble I get into. Instead of a review I’ll fill in one of those glaring gaps which has been haunting me since mid July… the naming of 2015’s Plant of the Year. Nothing like waiting till the last minute. It seems ungrateful to pass by all the old reliable sunflowers, snowdrops, and phlox which bring such joy every year but there can be only one, and this year the porcupine tomato wins that dubious honor. It’s been a long time coming though, probably four or five years ago was when I first caught sight of this plant on Nan Ondra’s Hayefield blog. Since then I’ve been on the search for one and finally last summer I came across a fruit laden plant during a garden tour. 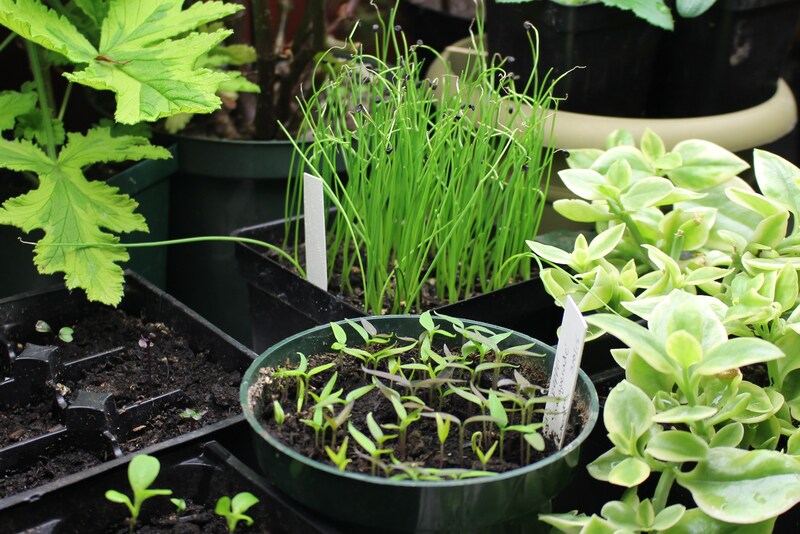 With the blessings of the owner was able to pocket a few seeds, and six months later I had my own little seedlings. Like a cute little baby eggplant, the porcupine tomato starts off innocent enough… but then the spines start. A little sparkle of dew gives the leaves a crunchy crystalline look. Sort of like those sugared fruits or flowers used as cake or desert decorations, except this one comes with its own built in toothpicks. 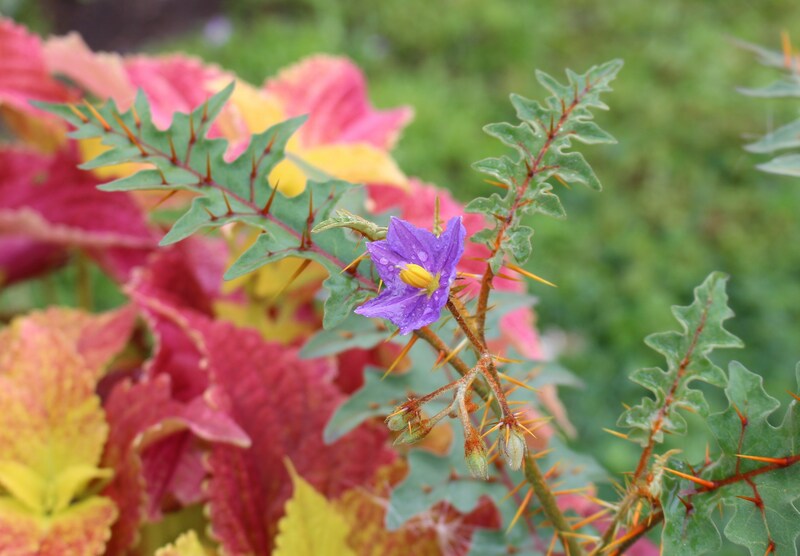 Flowers on the porcupine tomato (Solanum pyracanthum) look innocent enough, but then again even the most unsocial flowering plant can’t go around offending bees. But that’s often how things often go. For as hard as you try someone always gets hurt and in the words of most every Taylor Swift song, sometime the high is worth the pain. Happy New Year and all the best from suburbia, and if I can promise anything it’s that this will be the only time Taylor Swift is referenced in a blog post on porcupine tomatoes, 2015 or beyond! 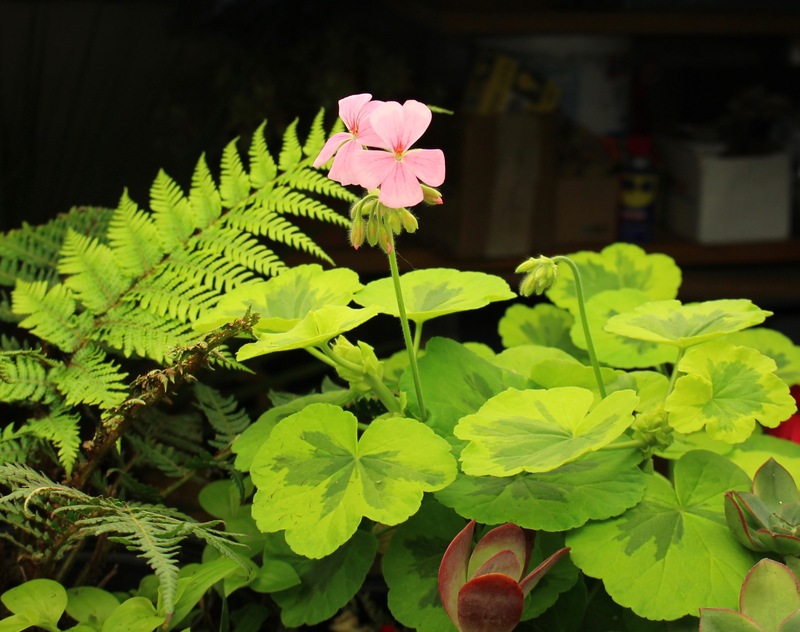 On the 22nd of each month Christina at Creating my own garden of the Hesperides encourages us to look past all the flowers and blooms of the garden and take a second look at what foliage does to support it all. I’m happy to once again take part in the fun, and what better month to do it in than May, the month where my garden really starts to overflow with the promise of the new season. Lets start with the front beds where hosta and self sown columbine have now sprouted up and covered the snowdrop and corydalis beds of early spring. 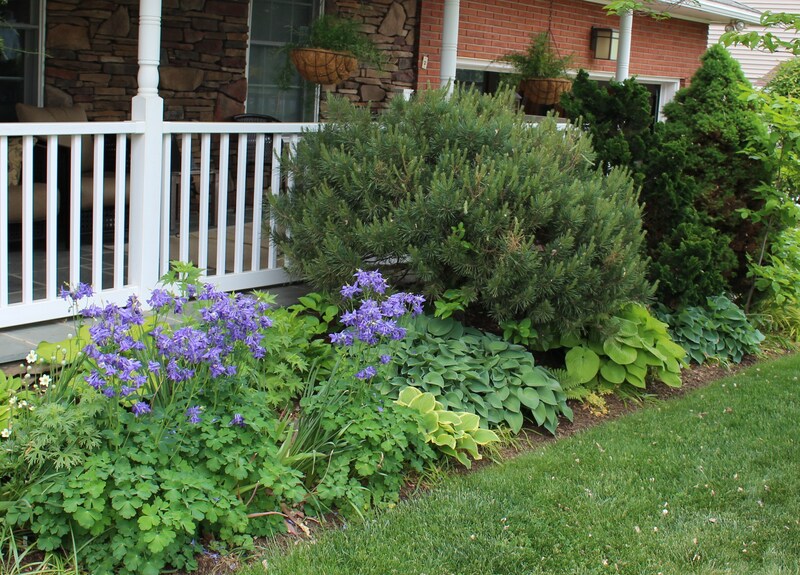 These blue columbine were originally found in the woods behind the house prior to its clearing for industrial park. They’re just escaped or dumped aquilegia vulgaris, nothing rare or unusual, but I like to keep them around as a reminder. Plus they’re carefree. 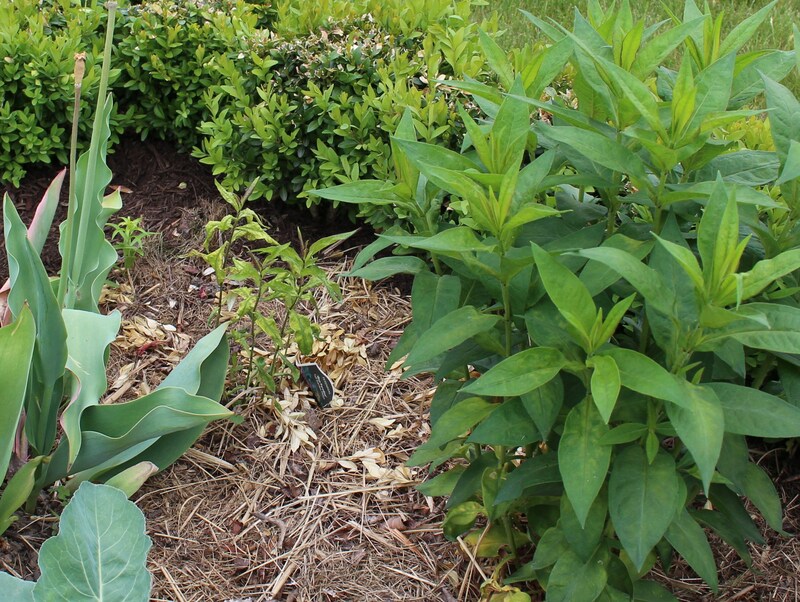 The just recently mulched, expanded and divided plantings of the front foundation planting. I love the different colors and textures out here at the moment, but my absolute favorite is the “white frosted” Japanese thistle (Cirsium japonicum). I know I’m in a lonely position here, but the prickly thistles always fascinate me, and in my opinion variegation is almost always a plus! 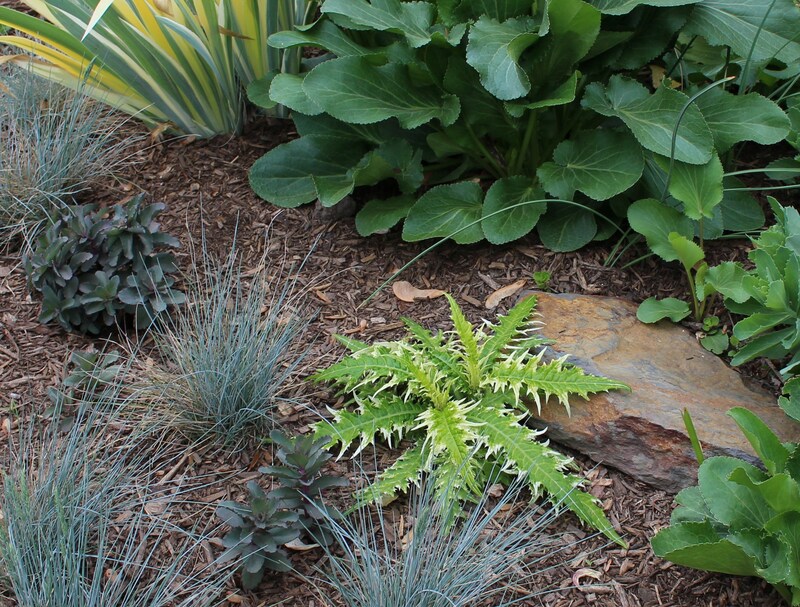 Cirsium japonicum ‘White Frosted’ with blue fescue and some just divided sedum ‘Bon Bon’. 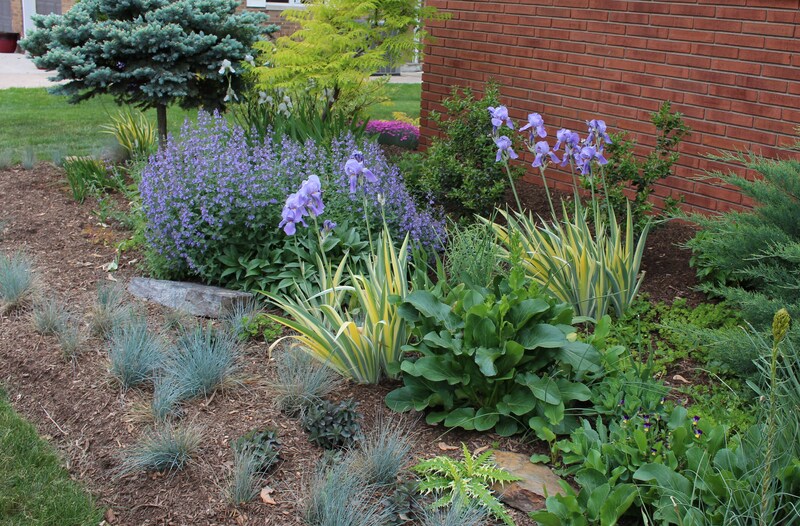 Even with the iris coming into peak bloom along the street border (it’s a good year for iris here), my favorite plant in this mix is the Ptilostemon diacantha. 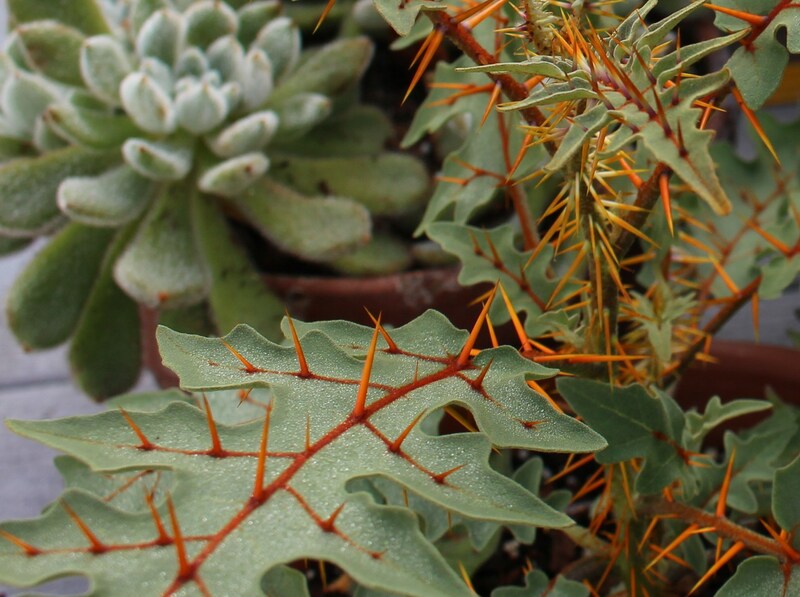 Some see a spiny weed in need of pulling, I see some of the coolest foliage in the garden. Historic iris like the poor soil and hot, dry and sunny front border, and even though the pale yellow iris “flavescens” does not like the wind, the reddish ‘Indian Chief’ and lavender ‘Ambassedeur’ stand strong. Foliage closeup of Ptilostemon diacantha. A biennial thistle from the Balklands/Turkey region in need of a common name. 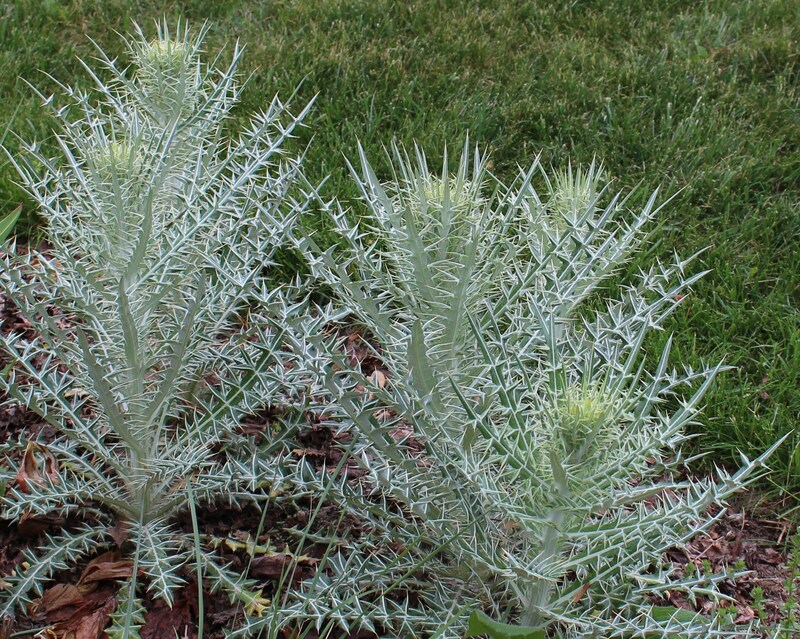 ‘Ivory thistle’ is the only one I came across and that one kind of bores me…. and with blooms of mauve I don’t see the connection. There are some friendlier foliages as well. The juicy fat clumps of this unnamed sedum spectabile (apparently Hylotelephium spectabile is its new name) always make me smile, no matter how common they might be. 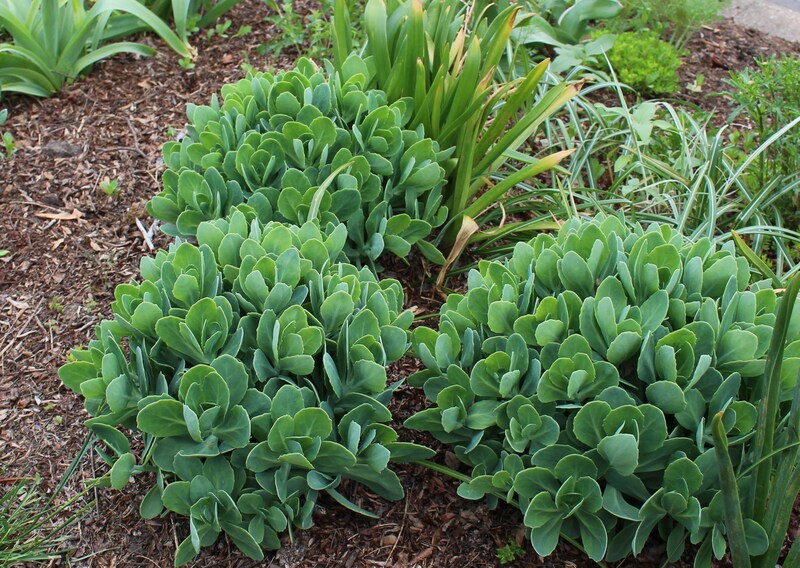 Spring clumps of sedum spectabile. The common types are unkillable, and one plant survived for two years after I put the clump down on a stone step after being distracted while transplanting. Another foliage favorite which I’m happy to have again is this plant of Silene dioica ‘Ray’s Golden’ Campion, which comes via seed from the talented Nan Ondra of Hayefield. It’s short lived in my garden but easy to grow once you get the seeds planted. Just rouge out the plain green seedlings. Silene dioica ‘Ray’s Golden’ campion with Artemisia ‘Powis Castle’ coming up behind. This section of bed is still in need of weeding, fortunately the shredded leaf mulch has kept most of the little guys from sprouting. When you circle the house to get out back, you pass what comes closest to a shade bed in this mostly sun-baked garden. 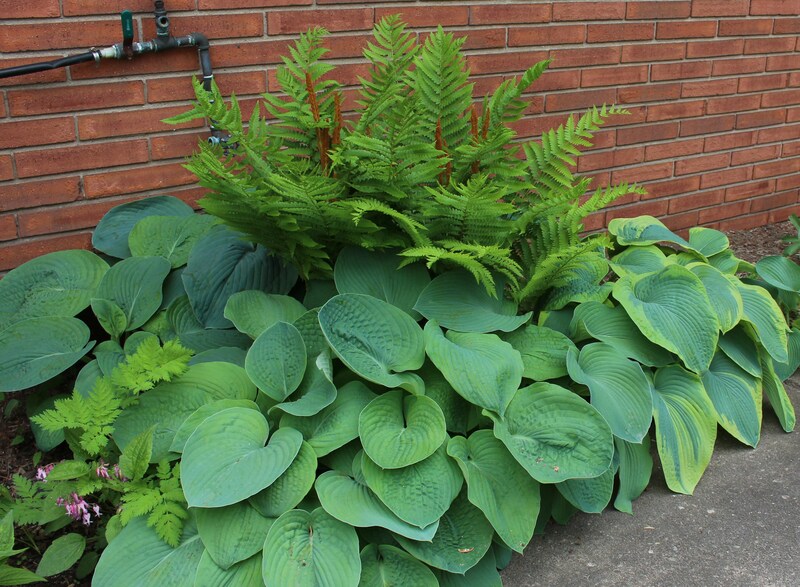 A leaky faucet (left intentionally so for the plants… and laziness) keeps these ostrich ferns and hosta happy here under the dry overhang of the house eaves. Hosta ‘Frances Williams’ (just barely noticeable to the right) is the mother to all of these hosta seedlings. I was curious to see if any would pick up mom’s variegation, but no luck. All have a similar bluish tint free of any color streaks, a plain look but still beautiful. 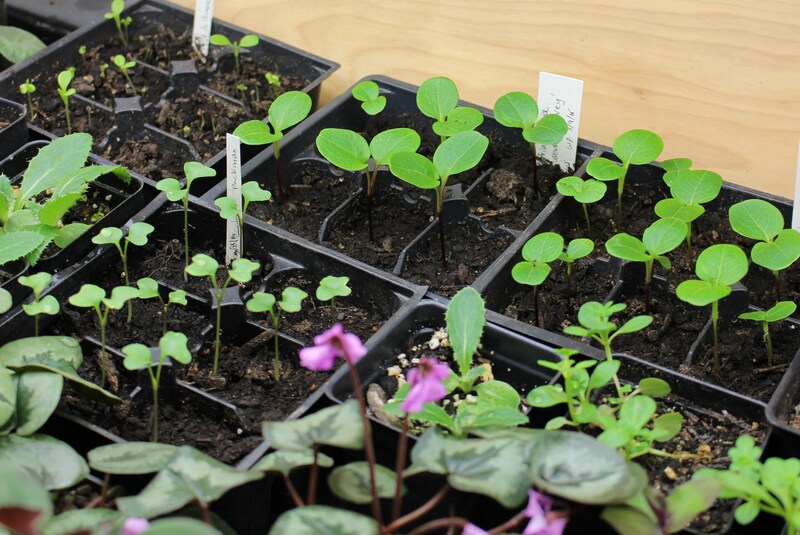 The rest of this month’s foliage celebration are also a celebration of wintertime seed sowing. 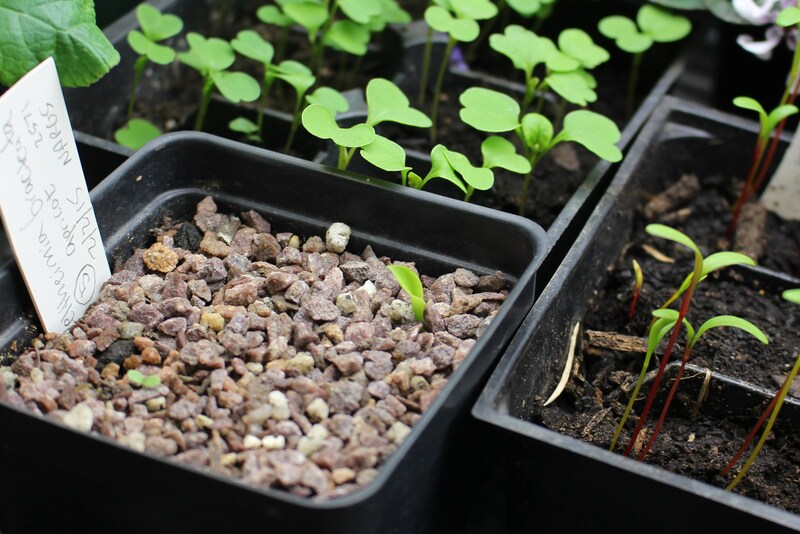 Lets begin with the seed trays. 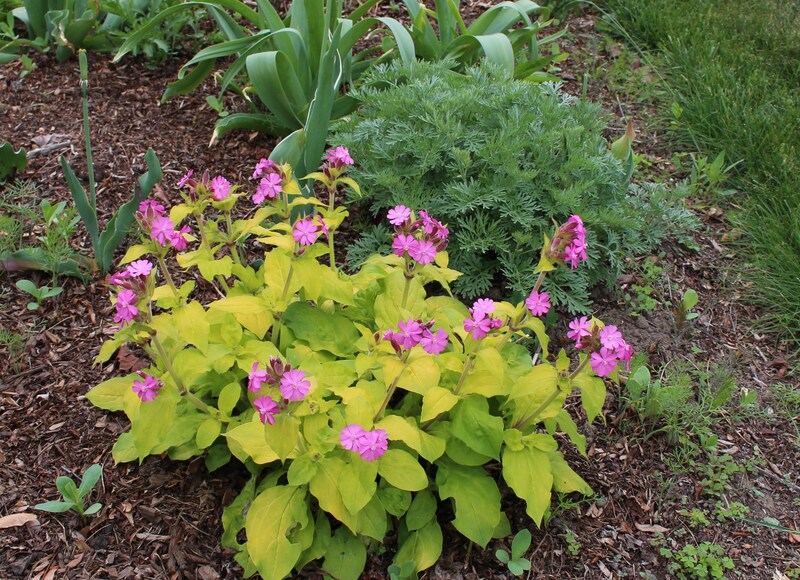 Any yellow leaved seedling is right up my alley. Out of my American Primrose Society seeds comes this one little oddball. My fingers are crossed I can nurse it along to adulthood. 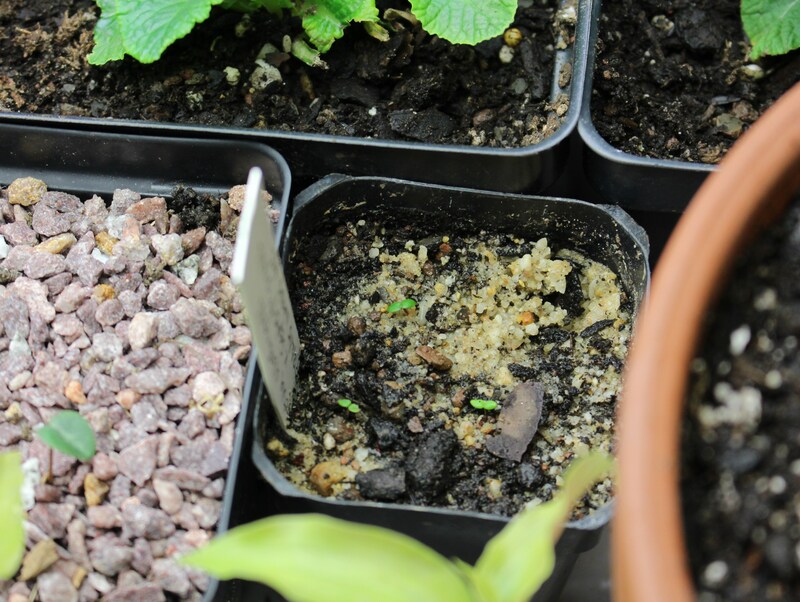 Primula polyanthus seedlings with one yellow leaved sister. I hope it stays this way and manages to limp through my on again off again care/abuse. -don’t know why the fly had to photobomb the center of this photo. Rosa glauca freshly mulched with a shovel full of compost. Sometimes neglect pays off. 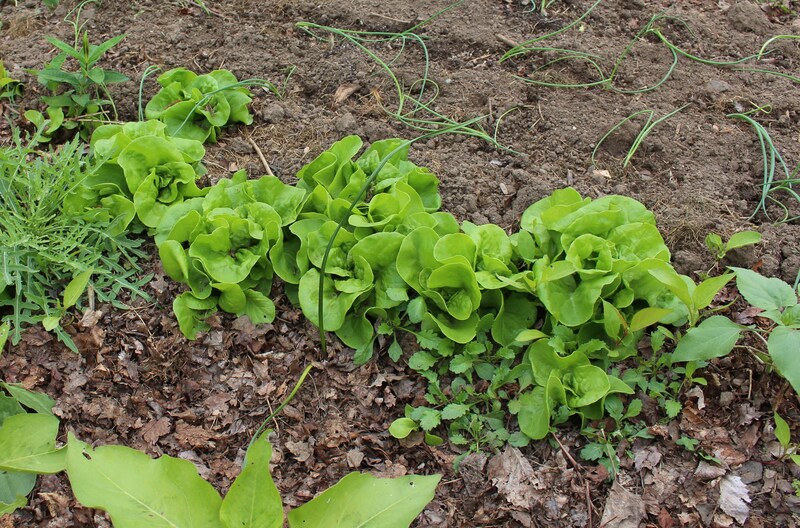 The lovely leaves of this lettuce crop are the result of not removing last year’s leftovers until they had bolted and gone to seed. They’ve even come up in a row as this was a ridge of soil where the mulch was blown off during some winter storm. Dare I say this planting is nearly as nice as the seedlings I fussed over for weeks indoors and then carefully transplanted and nursed along? The quality of my weeds is really coming along. In this photo there’s lettuce, a nice bunch of arugula, phlox, daisies, a daffodil and sunflower. I must stay strong and remove them all… this really is the only spot left where there’s any chance of fitting in a pepper. 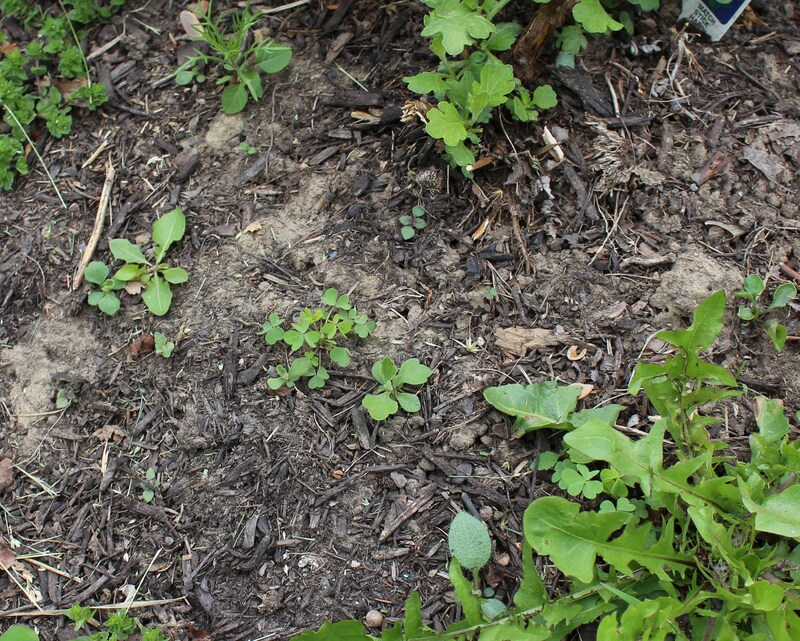 Another weed problem are the many chrysanthemum seedlings sprouting around last year’s plantings. I must rip them out as well, I have no room for more mums… says he who has a dozen more new little pots in need of planting. Not sure why I’m posting weed pictures, but you can make out the tiny leaves of chrysanthemum seedlings here amongst the dandelions and clover. What a difference. Phlox ‘Blue Paradise’ on the left has nearly given up under the spider mite attack, while his neighbor to the right only shows a few yellow leaves and yellowed stippling from the spider mites. I may just trim him back completely and hope for the best with any new growth which manages to come up. One more bad foliage visit. Sweet autumn clematis (Clematis terniflora) is a pest in my meadow garden and each spring I battle the legacy of the single vine planted along the fence next door. I suppose I could spray the clumps and eventually do them in, but I have to admit liking their patterned foliage and late season blooms…. even though I promptly rip the vines off before seed is set. 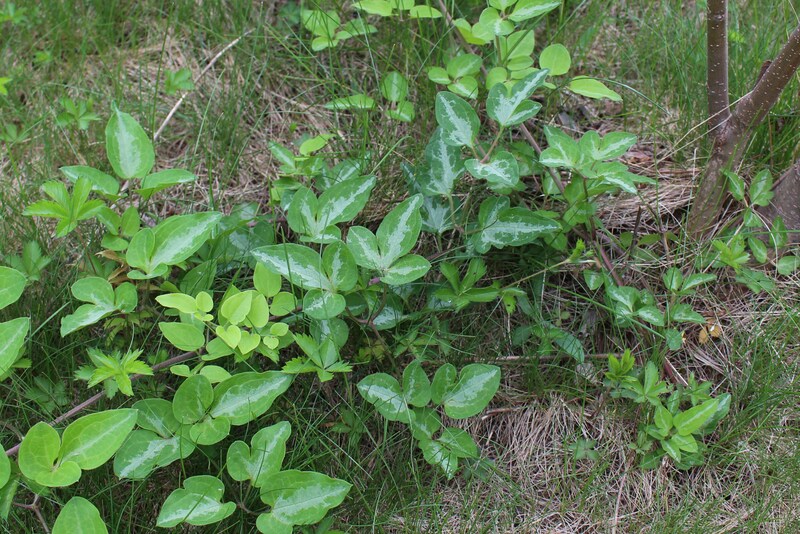 Japanese sweet autumn clematis (Clematis terniflora) foliage. I wish this wasn’t such an invasive thug. To wrap things up I’ll leave you with something a little cheerier. With the exception of a few rabbit decimated plants, the bulk of last years clearance heuchera have overwintered nicely and are showing off their fresh spring foliage (as well as their bland and boring flower stalks). Honestly I don’t like them all together in one big mess, but as plants grow (or die off) I’ll divide the survivors and see if I can work a few clumps into the rest of the garden and make some nicer foliage vignettes. So those are the foliage highlights from this end of Pennsylvania. If you’d like to see what others are up to please visit Christina’s blog to see what people across the world are seeing in their gardens. It’s always inspiring! Young ‘masquerade’ hot pepper seedlings, some onions, and other stuff. I guess for as cold as February was spring is almost on schedule. Maybe a week late. I should be cleaning the yard and getting things ready, but nothing’s ever perfect, and as long as there’s not a couple bikes laying on top of the hellebores I think there’s no rush and it will all work out just fine. In case you’re wondering I started a few more seeds to sooth my anxiety. Money plant (lunaria annua) ‘Rosemary Verey’ was one of my oops plantings. They surprised me by sprouting in the fridge, so out of the wet paper towels they came and under the growlights they went. They’re a purple foliage version of the regular moneyplant, and I think their dark purple stems look extremely promising! I’ve never been this bad with seed starting. 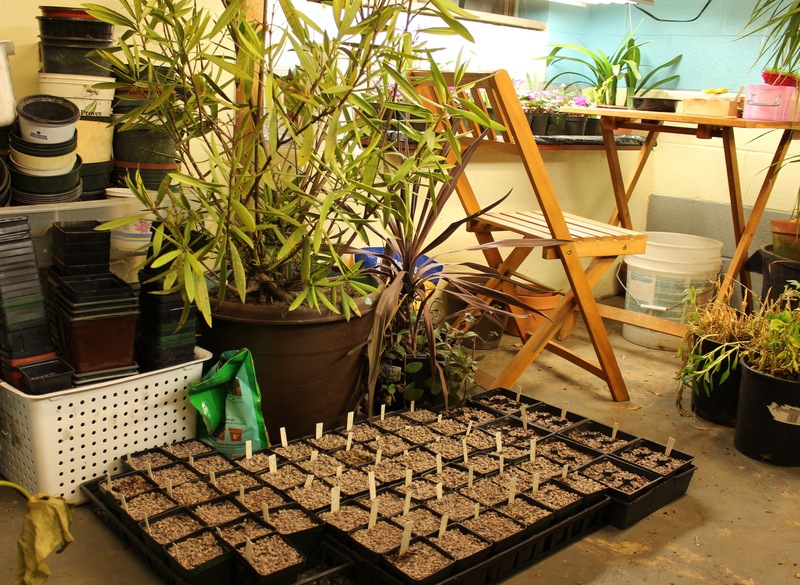 My thinking is that as long as I have the seeds I might as well plant them, so besides the ones sprouting under the lights I have a bunch outside in pots exposed to the cold as well. 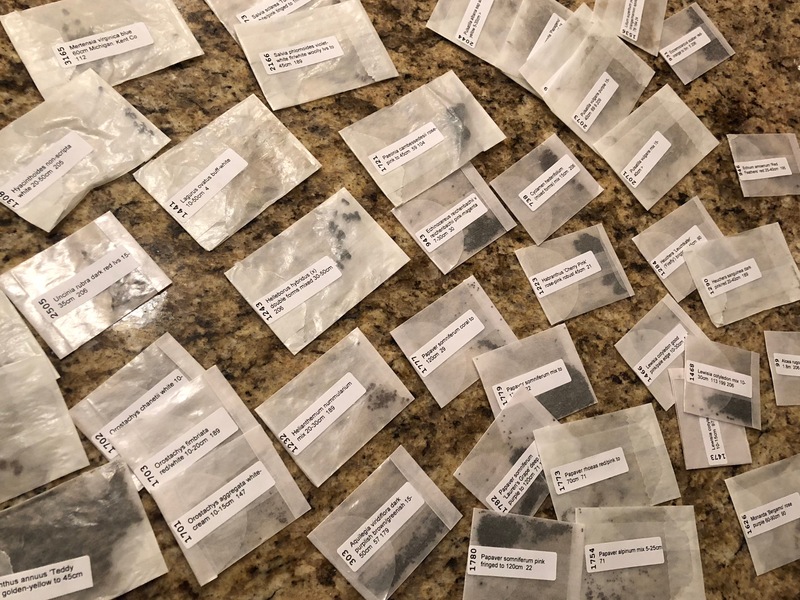 Also I suppose I should fess up to the dozens of baggies of seeds folded up in damp paper towels in the fridge which are also getting a nice cold treatment. Why do I need dozens of hot pepper seedling? Not important. 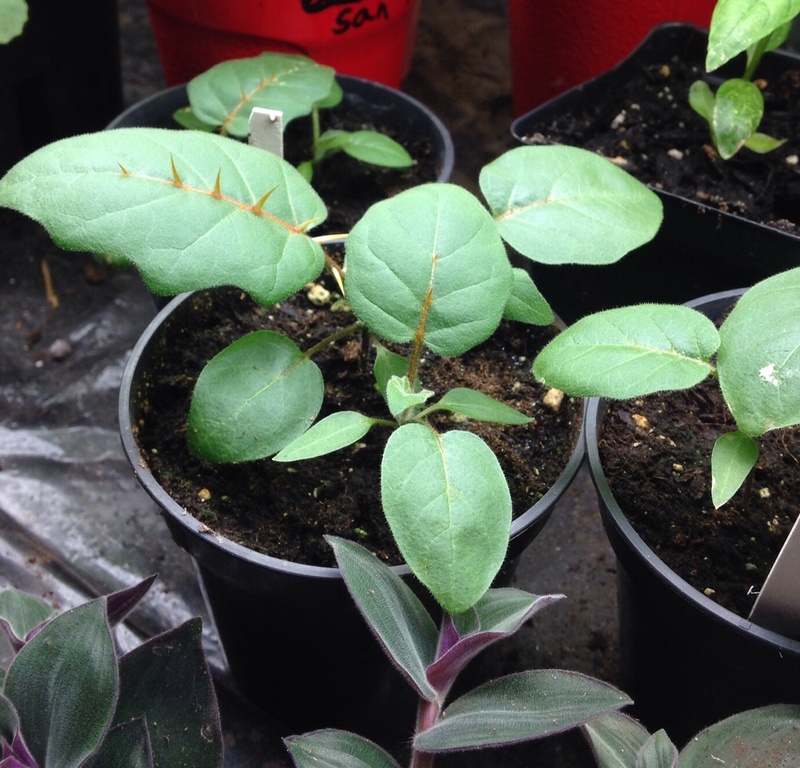 Why do I need non-hardy South African velthemia bracteata seedling? Because I can. (that’s a nearly direct quote from Chloris btw). So I’ll just continue sowing and growing more seedlings than I’ll ever need until finally I can get outside without a facemask and gloves. I’m ready for warmer weather. 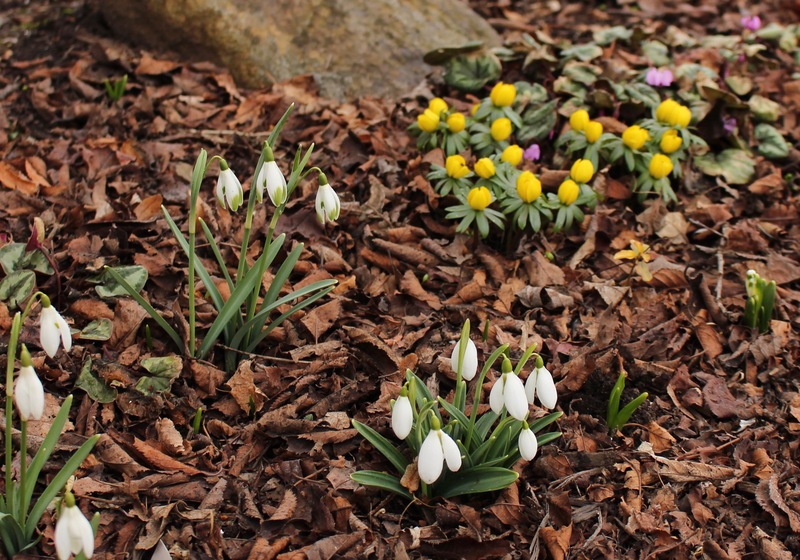 There’s still snow sitting in every shaded nook of the yard and far too many not-up-yet bulb plantings, but I want to see them now! Plus I need warmer weather in order to think over where the approximately 30-40 Magnolia Grandiflora trees will go. I potted those seeds up today.